Summary: On parallel journeys of sorts, Beatrice and Cass live in different time periods but are both facing the reorganization of their families after the deaths of their mothers. Connected by a star brooch and a shared home, the lives of Cass and Berenice intersect, allowing them to help each other through their challenges and grief. For Cass, their friendship helps her face her new stepmother and stand up for her needs in the aftermath of the loss of her mother, but for Beatrice, Cass’s insight helps her get out of a bad match to marry the man she is supposed to be with. Along the way, both must face their demons and find the strength to shine the light on the shadows in their lives. Review: When Cass’s father remarries Jean less than a year after the death of Cass’s mother, both Cass and her Aunt Blair are understandably upset. Suddenly Cass is sharing a room with Jean’s 12 year-old daughter and feeling like her mother is being pushed out of their home at all costs. Cass and Jean keep clashing, while Cass’s father seems to stand by and observe instead of stepping in and taking action. The star brooch Cass finds in the fireplace transports her to Beatrice’s time, providing Cass with a friend who understands what she is going through even though they live in different times. 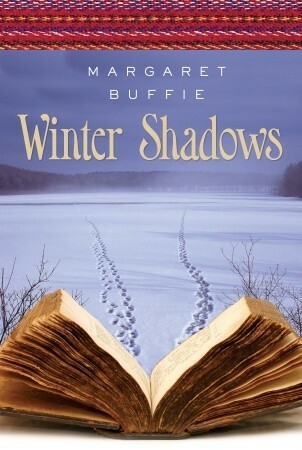 A satisfying read featuring lovely prose and emotionally-charged characters, Margaret Buffie’s Winter Shadows had me equally enthralled by both Cass and Beatrice’s stories. When the chapters ended and the perspectives changed, I was frustrated because I wanted to keep reading about the same character I had been reading about, but Buffie’s writing was balanced and I never resented the time spent with one character over another because they were both compelling. I love the idea behind it, being able to connect with your ancestors in moments of trouble, and how her experiences eventually lead Cass to realize death isn’t always a barrier to contact with loved ones. What I also love about Buffie’s writing is that while at first certain characters seem either good or evil, she endeavours to bring out the complexity behind each situation and helps her reader have empathy for everyone involved. Buffie has a particular talent for writing realistic scenes of anger, miscommunication and frustration. The ending isn’t neat for Cass, but I liked it better that way because Buffie is acknowledging Cass’s life has irreversibly changed after her mother’s death. Maybe in time she and Jean will learn to tolerate each other, although any work on their relationship needs to include Cass’s dad because Cass’s hurt involves him too. Until then, at least her Aunt Blair is there to support her and they can help each other through their grief. It’s a powerful, well-written story about two young woman finding their places amidst challenging circumstances, and I thoroughly enjoyed it. Winter Shadows by Margaret Buffie is published by Tundra Books, (2010).